It's a shame the electrified sound doesn't match its excellent acoustic performance. Find one that does, however, and it'll be a fine flamenco-style electro. Good build and flamenco-tinged acoustic performance. Uneven string outputs when plugged in. Aping a 'blanco' flamenco-style construction with a solid spruce top and laminated sycamore back and sides, this guitar has a clean Spanish-style build. The dark (rosewood) binding makes for a strong contrast to the clean 'white' body woods. Internally, it exhibits its Spanish heritage with slipper heel, mahogany back braces and spruce top bracing. The big difference between this guitar and traditional Spanish models is the thinline depth of 75 to 68mm (2.95 to 2.68 inches), intended to help with feedback rejection on stage. 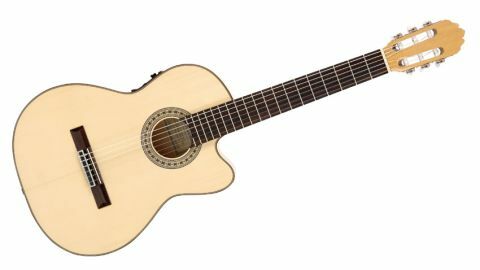 String height is fairly generous (flamenco guitars traditionally have a lower, buzzier action), and the neck is quite flat-backed in profile. "With the trim body comes an explosive response that's not short on low-end despite its size"
There's room to the acoustic sound here, despite the trim body. With it comes an explosive response that's not short on low-end despite its size, and with a nice upper-frequency attack. The under-saddle pickup suffers from slightly uneven string response when amplified. The sound is quite thin and bright overall, the preamp EQ effective on the under-saddle, although the internal mic produces a feedback-prone boxy tone that is of little use at higher levels, especially since it's a mono-only output.